The Best-Worst Survey approach is a powerful tool to understand customer preferences because respondents must trade-off service features against each other. The feature list was developed from a series of customer interviews allowing the “voice of the customer” to be captured and thus identify the features that customers may believe are important. The Best-Worst is approach is distinctly different to the more commonly used approach where respondents simply rate individual features based on a scale that ranges from, say, Very Important through to Very Un-important (i.e., a five-point Likert Scale). The Likert Scale approach often results in respondents allocating their responses for most of the features to predominantly on one side of the scale or the other (i.e., Very Important/Important or Un-important/Very Un-important) – or all around the neutral position (Acceptable). Thus there is little differentiation in scores between features making it difficult to determine the relative importance of features. By contrast the Best-Worst Survey approach requires the respondent to actively select and compare features. They decide what they value most and least in a series of carefully designed groups. The result more accurately reflects the reality of the business world, where there are limited resources available and customers make feature trade-offs in their choice of supplier. The questions in a Best-Worst Survey are arranged so that each feature appears only once in a group, and only once in a specific position (first, second, third, fourth or fifth in the group), and only once with each of the other features. 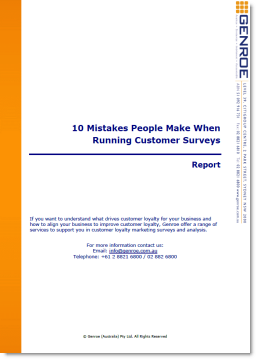 The requirement for a customer to select the most important and least important feature in each group in a Best-Worst Survey most accurately pins down the position and order of the features at the two ends of the range, i.e. most and least important.